Portable ArsClip gives you a much more powerful clipboard than the default in Windows. It adds so many bonus features that you might not even know where to begin. 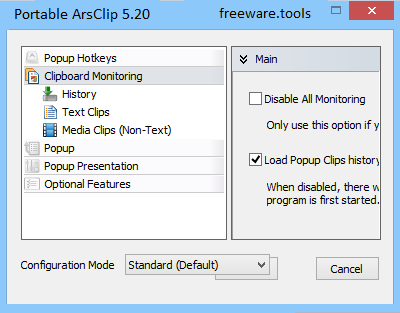 Portable ArsClip is a utility for the Windows clipboard. ArsClip monitors the clipboard and keeps track of the entries. Press a configurable hotkey and select an item (or items) to quickly paste into a program. ArsClip used to be barebonez, but I think I can safely say that it has become a nicely featured program (due to user requests for changes). ArsClip remembers the last 15 (default) text entries entered into the Window's clipboard. Delphi 6 (Personal) source code is included - modify it freely for any non-profit use. Portable ArsClip is a software application that is able to monitor all the entries that you copy to the Clipboard. Since this is the portable version of ArsClip, you can copy the program on any USB flash drive or other devices, and take it with you whenever you want to simply the entire process of copying multiple text pieces. Once you run the application, you are welcomed by a configuration dialog that can help you make the application load the Clipboard history at startup, disable the monitoring process, replace formatted text with plain text, ignore text if it’s very small or larger than a specified value, as well as enable text formats and the order or preferences (RichText, HTML and Unicode). The application manages to keep track of non-text clips, and you may select to monitor picture and sound clips. Portable ArsClip keeps a history with all the clips, and allows users to edit or delete them pretty quickly. You can also preview the selected entry in a dedicated window. Another important feature that is worth mentioning is the possibility of exporting the clips to plain text or HTML. Hotkeys are also available and they can be reassigned. It also features a floating window, which displays the current entry to the Clipboard. Furthermore, you can enable sound notifications and browse the computer for an audio file, provided that the file format is WAV, as well as create macros. You can also customize the look of your applications by changing the font style and color. In conclusion, Portable ArsClip can be considered a handy application that is able to keep track of all entries that you copy to the Clipboard. It doesn’t take a lot of time to get used to working with this tool, and is also light on the system resources.